What is this BDS beauty trying to say? Living in Seattle, the stone cold heart of the anti-Israel BDS movement isn’t all fun and games, well OK it is. Case in point, this photo of a University of Washington (Go Dawgs!) student supporter of divestment from Israel. 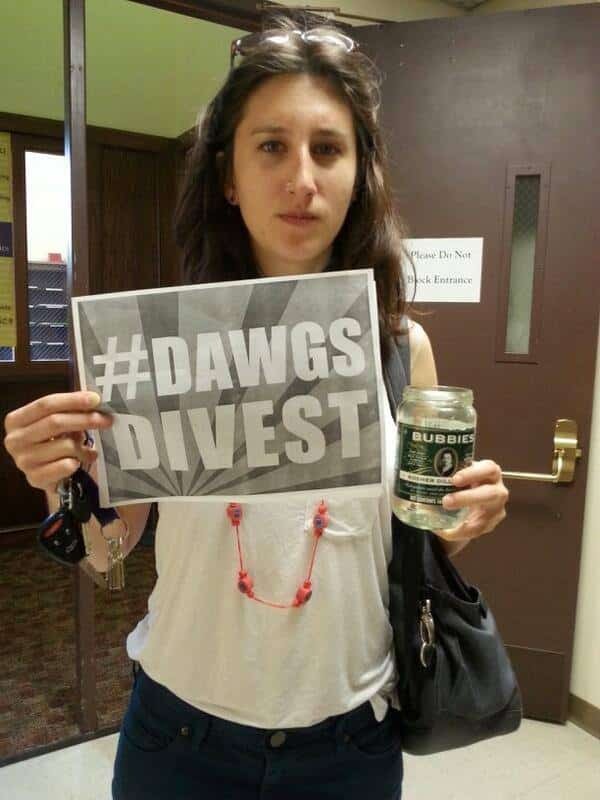 In her right hand the silly student is holding a divest from Israel placard, we get that, but in her left hand is an empty jar of Bubbie’s Kosher Dills. What on earth is this clever co-ed trying to say? Is she suggesting that as part of her boycott of Israel she wants to divest from a California pickle company? Does she have something against Jewish grandmothers? Is the problem Kosher pickles or cucumbers in general? Aussie Dave suggested that this opportunity is ripe for a caption contest! Post your suggestions in the comments section, the winner as chosen by our elite panel of judges (me) will have their caption forever enshrined in a cartoon bubble above the BDS beauty.